Bad And Boujee Tops The Charts! RAIN DROP...DROP TOP….Y'all know the rest…!! America's favorite song “Bad and Boujee” reached the number one spot on the Hot 100 chart Tuesday night, according to Billboard. Before the song hit number one, it was number two, But when the award winning actor, Donald Glover, gave the song a shout out at the Golden Globes Award it quickly caught everybody's attention, leading it to the top of the charts. Since then the song’ s Spotify streams has increased by 243%, according to FactMag. 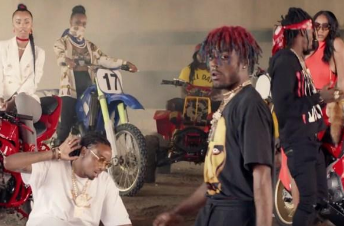 The song that dropped in October 2016, features Migos and Lil Uzi Vert. Of course it was produced by the one and only “If young metro don't trust you, I'm gon shoot you,” Metro Boomin, who also produced for other artist such as Future, and 21 Savage. With “Bad and Boujee” reaching number one it knocked down popular hit record Rae Sremmurd’s “Black Beatles,” which was a hit for the viral mannequin challenge that had everybody and their mother doing it. This is a huge deal for Migos, with this being their first number one single. Their sophomore album, C.U.L.T.U.R.E, will be released January 27,2017! Congratulations to Migos, keep making hits!